Are you a soup lover? Do you fill it’s magic power of healing heart and soul? I really love soup so there is almost always a fish, vegetable, meat, cream or clear soup on a daily menu. If I must pick, my favorite would be creamy textured veggies soup. You can use almost anything out of garden or market : asparagus, zucchini, potato, pies, carrots, parsnip, cauliflower… I just has to be: simple, healthy and served hot! This Sunday I went to the market with world favorite shopping company, my two year old son Luca. He always gets an apple, pear or tangerine from lovely people from the market so he enjoyes it probably more than I do. We bought lovely pumpkin, organic carrots, parsnip, celery leaf and root, parsley and onion. He watches me cooking since he was born so his favorite toy is actualy a pot! He loves to pretend he’s making a soup or cooking eggs, so cute! While I was making a pumpkin soup for Sunday lunch I got hungry and took tasty fish soup I made the day before from fridge and warmed it up. So yummy! Here is the way I prepare a pumpkin soup, it’s really tasty, simple, affordable and meatless. Wash and peel pampkin, carrots, parnsip, celery and onion. Wash parsley and celery leaf. Cut all root vegetables in large pieces, there is no need to bother with small cubes since we need to mix all up when cooked. Put it all in pot, season with salt and pepper (we love to use more pepper and less salt to feel lovely sweetness of pumpkin) cover with water and cook for about 40 minutes. This time I used lovely personalized Silit pressure cooker we got as a gift, it took about 20 minutes after hearing steam sound. Let it cool for few minutes and blend it for creamy texture. You don’t need to trow away excess of soup as it can be used as stock for wonderful mild risotto. If you don’t want to cook it now, you can use good trick- soup ice cubes you can use every time you want a vegetable risotto! 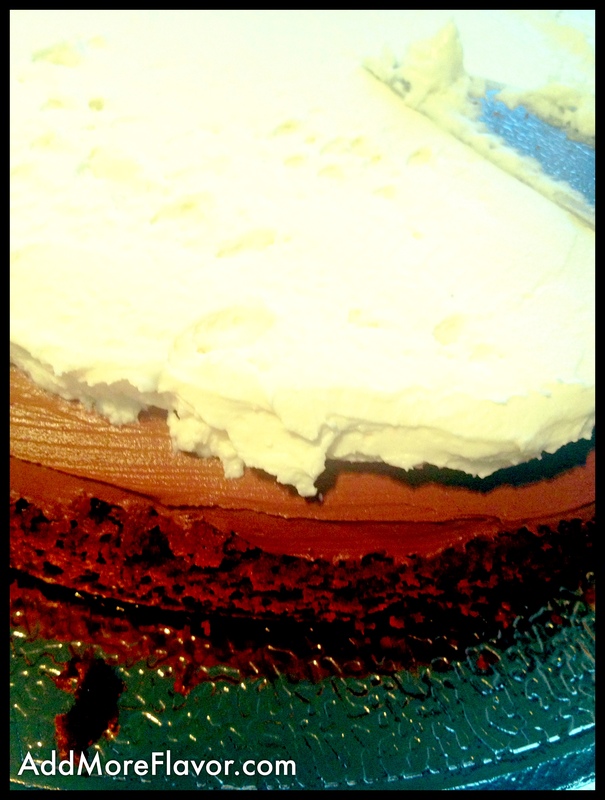 It’s been my mission lately to find simplest and quickest desserts recipes. I never ever bought pudding or any other dessert that pops out of a bag, don’t trust instant food. I think it’s way better to make pancakes in case of sudden, unexpected guests or night crave for something sweet. Let me share a tasty and simple dessert I made atleast 4 times last month. All you need from fridge for this great 10″ dessert is: mascarpone, eggs, sugar, some liquer and vanilla been. All other ingredients are optional. 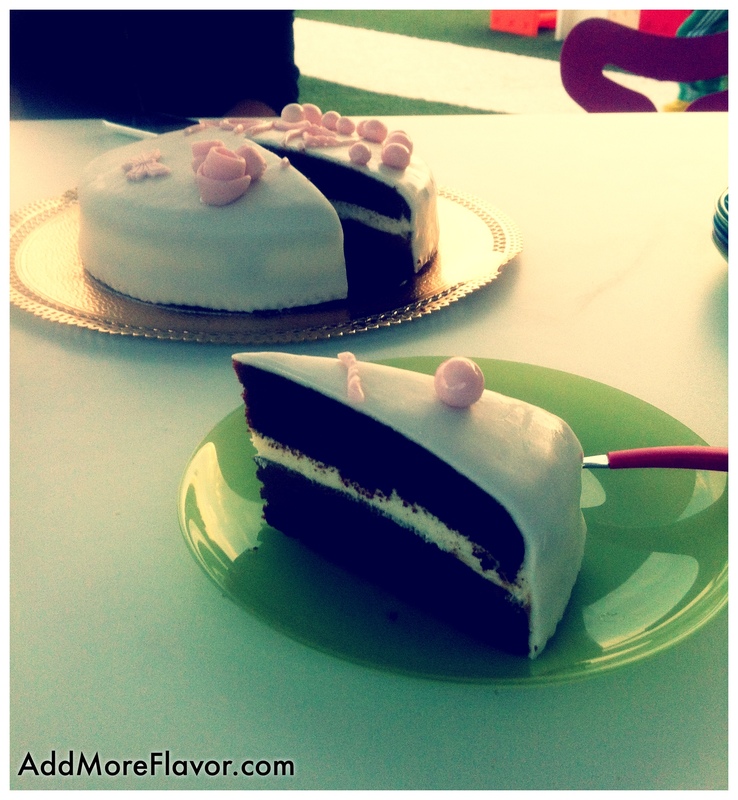 Be prepared to recieve as much compliments as when you make complicated layer cakes! Separate the egg whites from the yolks, beat yolks with sugar until the mixture is light and fluffy. Add cognac (don’t stop beating), mascarpone cheese and finally vanilla seeds. Beat until all ingredients are well blended. Add previously firmly beaten egg whites stirring with a spatula from the bottom up. Chush your favourite cookies on the bottom of 4 bowls, add one half of mascarpone cream, few drops of nutella and marmolade and cover with second half of mascarpone cream. Sprinkle all with grated dark chocolate or good quality cocoa powder. You can put also cruched almonds, crunchy granola, hot chocolate souce, hot berry souce…use whatever you find in your house. We invited frends over for dinner last night. As we got back late from work we were pleased that our son wants to go to bed early, otherwise top achievement would be tomato and basil bruschetta. What do you prepare in lack of time when you still wish to make an impression? I remembered that I recently bought home made tortillas from one lady that prepares them for local restaurants, I’ve put them in freezer, just in case of unexpected guests or mexican food hungry husband. It was excellant opportunity to add spicy flavor in early October night. I would have made them myself but admit that bought ones were perfectly thin, elastic and tender. If you have great proven recipe for tender tortilla, please share! Thing I like most about tacos, burritos and wraps is wonderful food sharing. So many colorful plates and bowls on dinner table, smiling faces that are busy making their meal and passing bowls to each other. First time I tried tortilla was ten years ago when I was living at Munich, Germany. I was there to learn german after graduation and my dear friends who live there invited me over for dinner. Ever since I love to prepare them for friend because you get to prepare something tasty and (more less) healthy that it sutable also for my vegeterian friend Aleksandra, and to enjoy it yourself. I don’t know about you guys, but how often do you get to sit peacefully with your guests when preparing dinner? I think there is no need to write in steps recipe but will be happy to share what was served last night on our table. If there is need process description please comment! 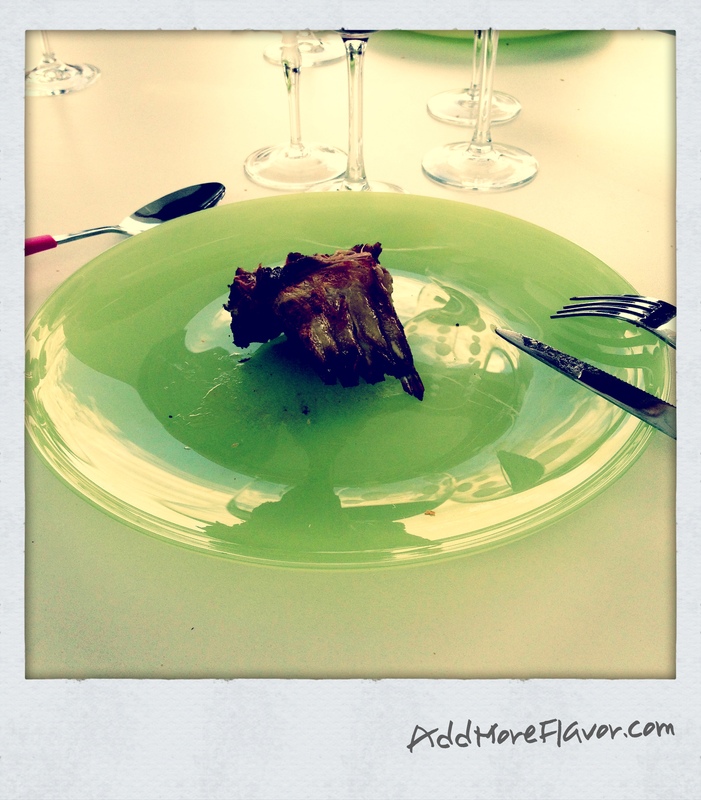 Tabasco and other spices on table according to taste! Heat tortillas on hot pan for few seconds on each side, cover to keep them warm for serving. Let your guests decide what and how much to fill. Eat with hands please, forget forks and knife! It was so good that I forgot to take more pictures! I finished dinner with simplest dessert I ever made. My hubby liked it so much that we ask me to do it again today after lunch. Read about it in my next blog! I know lots of people who don’t eat breakfast. I’m not one of them, actually it’s not good idea to go near me if I leave home without having proper breakfast. I stick to good old oatmeal for more than 15 years! Although I often change way how to prepare it. I use to eat it cooked with cinnemon or mixed with whey based protein but more recently swiched to rolled oats mixed with raisin, dries cranberries, sunflower and golden linseeds. I don’t eat any diary product for 2 months now so changed skimmed milk with almond or oat milk. It’s simple to make your own milk at home and much cheaper so you must try if you use it. My two year old son also loves this super healhy oat mixture. I read somewhere that it’s really important to use omega-3 fatty acids in kid’s diet and linsed contain an abundance. It’s suposse to be important for brain development so go shopping everyone who wants to have baby Einstein. They can even lower cholesterol level, what a great job for such a tiny seed. My husbant is bread, butter and marmolade type of breakfast eater. He adores fig&orange marmalade from “Dida Boža”, even though we have lot of home made marmolade and jam he somehow always buys this brand. On weekdays we are always in hurry so he usually eats some crunchy granola with plain jogurt. As he often compaints prepacked cereals are to sweet and graesy few days ago I decided to surprise him with homemade granola. Everything seamed perfect until I turned oven on and started cleaning bedroom. Granola was overbrowned and bitter as I remembered to turn oven off after more than one hour! You can guess my darling wasn’t exited with breakfast so he took banana from fridge after tasting my granola. This didn’t encouraged me to repeat lesson yesterday! There are so many granola recipes all over blogs and web sites but I think prepackaged still take advantage over homemade granola. Everybody who wants clever, fast and nutritious breakfast should make own granola because you can personalize them in so many ways. Here’s my favourite mixture adopted from www.eatthelove.com . Really excellent balance between sweetness and crunchiness. Preheat the oven to 300˚F. Place the cereal, nuts, seeds, spices and salt in a large bowl. Place the sweeteners, oil and vanilla in a small pan and heat on medium until the dry sweetener has dissolved into the wet sweetener. Pour over oats, nuts and cinnamon, folding to coat evenly with a large spatula. Add egg whites. Pour the granola onto the rimmed baking sheet. Spread the granola out until it’s flat and evenly distributed. Bake in the oven for 20 minutes. Take out and sprinkle the dried fruit in the middle of the pan. Using a heatproof spatula, “pull” the granola from the edges of the pan to the center, creating a heaping pile over the dried fruit. Then press down and spread the granola with the fruit mixed in, over the pan again until even and flat. You may need to pack the granola in tightly with the spatula. Bake for an additional 15 minutes. Take out of the oven and let cool in the pan until absolutely at room temperature (if you start picking it apart, the granola won’t stay chunky). Store in an airproof jar. This granola is perfect as a snack so please enjoy! Grandma is always the best cook, isn’t she? I think it’s because they stick to proven recipes. “Old school” cook doesn’t care for hips and belly if they put little more sugar of fat in meal. Everyting must be done according to a recipe which they store in memory. Interesting, they write your telefone number but know by heart how much flour or eggs to put in a pie or cake. I started cooking as a teenage, showing always interest in pots and pans. It was time I tried to convince my grandma to prapare everything more ” light” because it’s age when most girls start waching calories intake. It was later I realized why her lunches and dinners taste so yummy and why her soup tastes and smells the same all the time she makes one. My grandma makes best fresh pasta in the world, every time we gather there’s no doubt what will be served on table. We order only šurlice, fuži or pljukanci, fresh pasta traditionally made in some parts or Croatia. She complains often that she would like to cook something else but pasta but we satisfy her desire just for holiday occasions like Easter, Christmas or New Years! Why change something perfect? 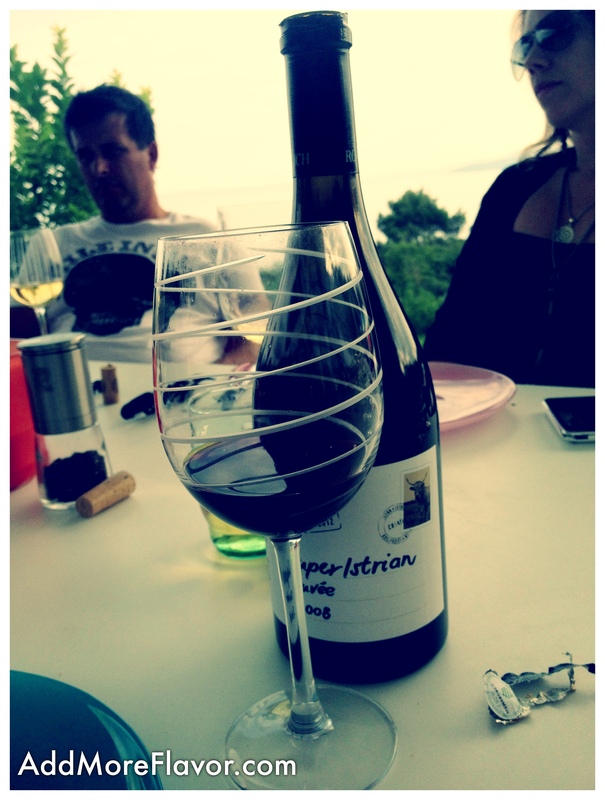 Her origins are from island of Krk, later married my grandpa from Istria. Both parts of Croatia prepare great pasta and gnocchi but she underlines that she learned everything before marriage, obviously proud of her origin. It was my grandma’s bday few days ago. 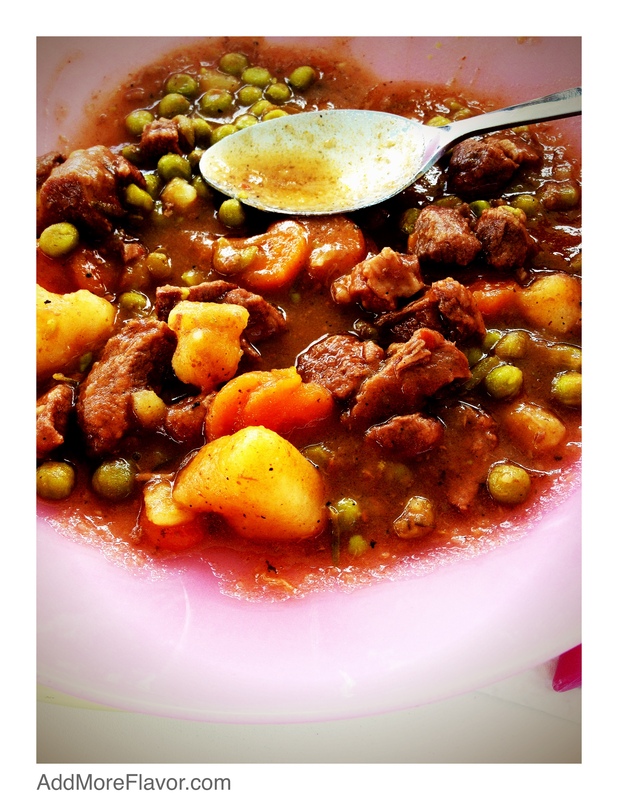 We ate meat soup and pljukanci with gulash. It was my task to do a dessert. I choose to use 100% organic pears from garden combined with fine chocolate. p.s. I plain to ask my grandma to learn me how to make pljukanci, I’ll be happy to share once I learn. Grandma said she won’t have time to make a dessert after pljukanci, gulash and soup so I was happy to help. My choice was pear and chocolate cake, there are so many recipes one can find online, if you like try this one, it’s really tasty. My father warned me grany might also make pear crostata (because she allways makes one during pear season) and she did! So we had two pear desserts that day! What a pear party! It’s important to choose mature pears that contain lot of juice and good quality chocolate. It takes about half an hour to prepare this cake plus 40′ baking time. If you don’t have amaretti, butter buiscits will also do the job, I actually put “cantuccini”, great italian dry almond buiscit that my grandma made about 2 weeks ago. Cantuccini taste great and can last for months if closed well in air proof bowl. First, peel the pears, cut into quarters, remove the seeds and the central hard parts. Place them in a large pan without overlapping, pour in prosecco and cook until complete evaporation of the cooking liquid. Meanwhile chop dark chocolate and steam it adding 1/3 cup of butter cut into small pieces, stir to dissolve well. Then cool. Mix the remaining butter with 1/3 cup sugar and egg yolks until you get a nice smooth and light cream, to which you now need to add to the melted lukewarm chocolate. Pour the mixture into a large bowl and add finely crushed amaretti biscuits, the flour and sifted baking powder. Beat the egg whites until stiff, stir in the remaining sugar beating for few more seconds. 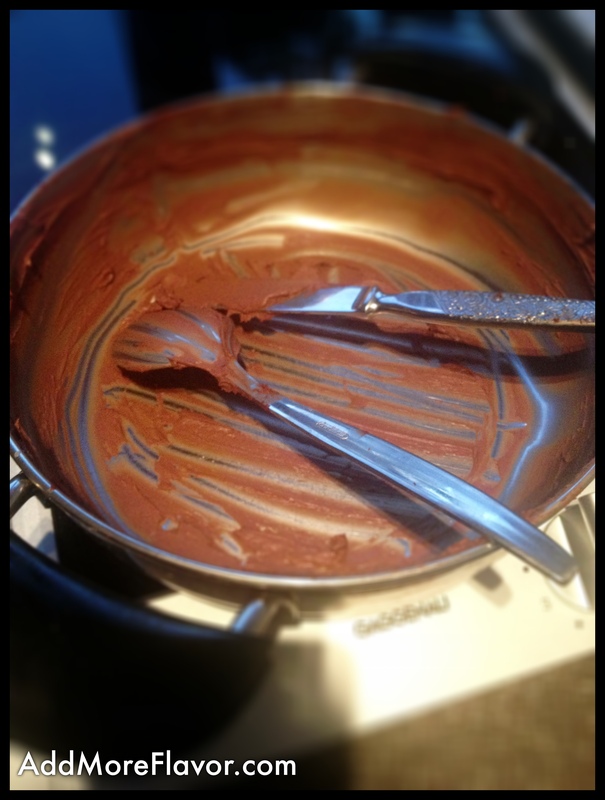 Unite egg whites gently into the chocolate mixture, stirring from the bottom up. Divide dough in two parts, pour the first part into a greased and floured 9 inches cake pan, cover with the pears and finish with second part of the dough. Put cake in a preheated oven at 350 F for at least 40 minutes. When ready, leave it for about 10 minutes in the cake pan to cool, and sprinkle with icing sugar. Serve warm or cold, as you like it. Shame I didn’t take picture of my grandma’s crostata, it was very delicious! Well, I hope she’ll make one soon while pear season lasts. I love figs, they’re perfect fruit in every sense. It’s not just the taste but also beauty it’s leafs, delicate nectar and strong tree. 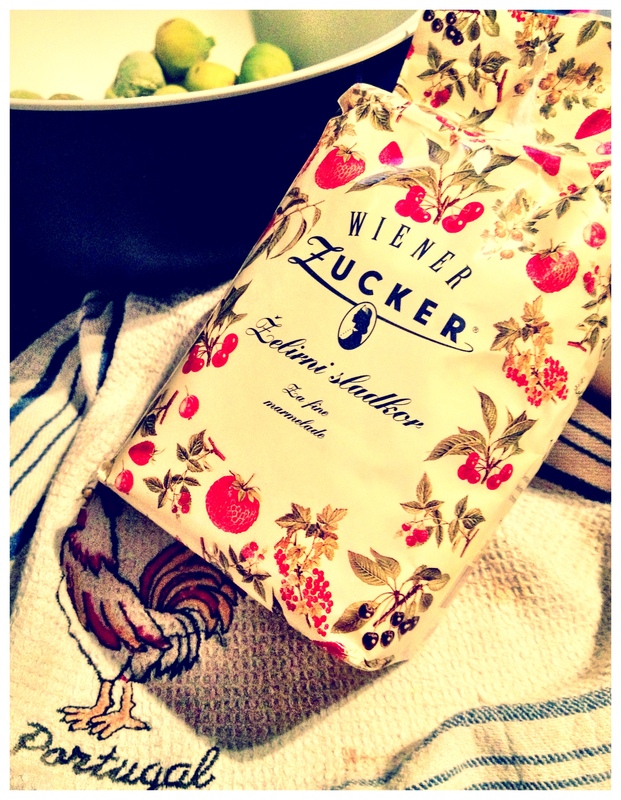 This seductress comes in late summer but going away so quickly… you’d better hurry up and prepare something delicious. We have big fig tree in our backyard, I love to eat them directly from tree (so rarely bowl returns full in kitchen when I go to pick up figs). There are so many great ways you can prepare figs, it’s a pity to use them just for jelly. One of best desserts one can taste is definitely “Kukuriku Figs” from one excellent Croatian restaurant. It combines figs cooked for hours in prosecco and rosemary, served with mascarpone cream and pieces of homemade cinnamon biscuit. I plain to make and share soon because I never made it with fresh but dried figs, curious to see a difference. Today we had great lunch, anchovies carpaccio served with toasted baguette, grilled sardines with potatoes and plenty od chicory salad. 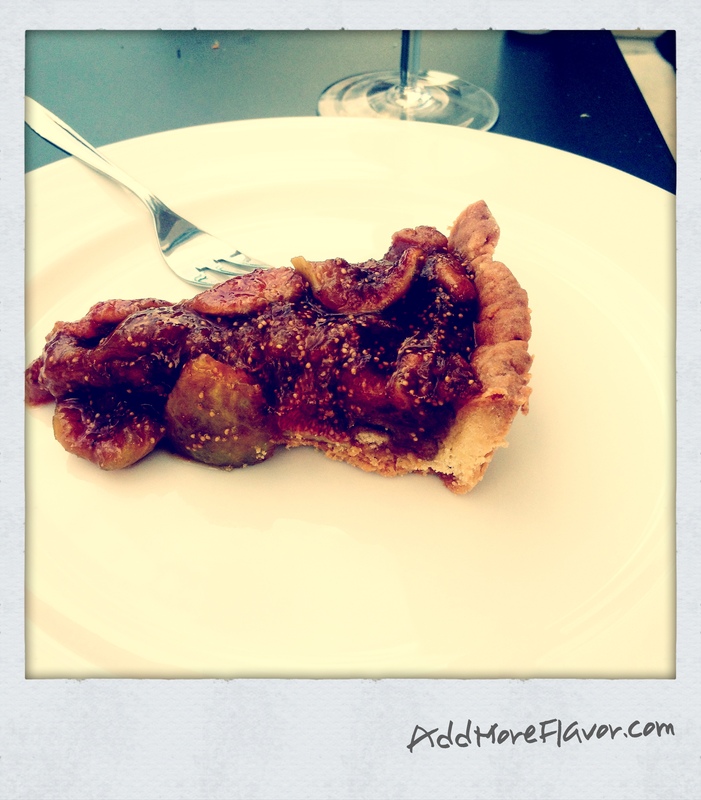 Everybody liked Fresh Fig Crostata I made last night for dessert so I wanted to share recipe. It makes about 10 servings. Make dough: In a food processor, pulse flour, sugars, salt, egg yolks and cold butter, it takes not more than 2 minutes in food processor or few more if you do it manually. Do not overmix. 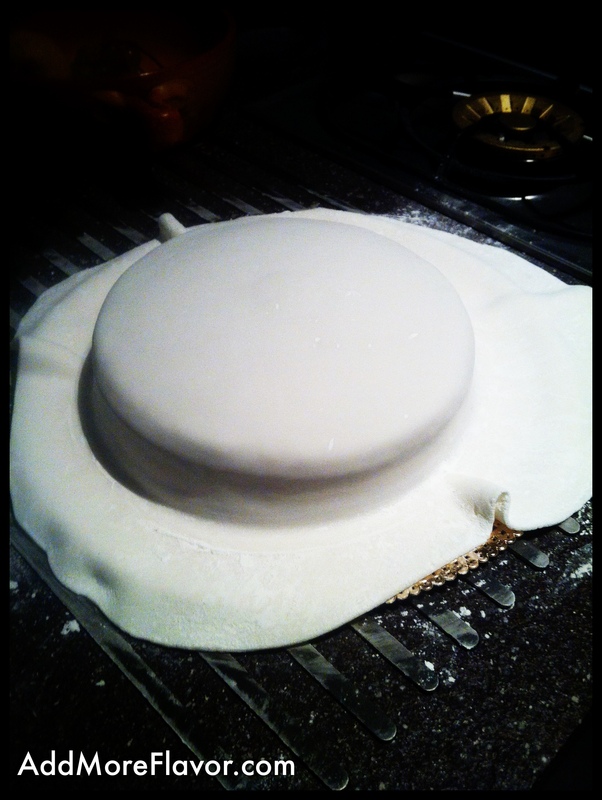 Flatten dough into a disk; wrap tightly in plastic. Refrigerate for 1/2 hour. Preheat oven to 320 degrees. On a large lightly floured piece of parchment paper, roll dough to a 9-inch round. Prick the dough all over with a fork and bake for 40 minutes. 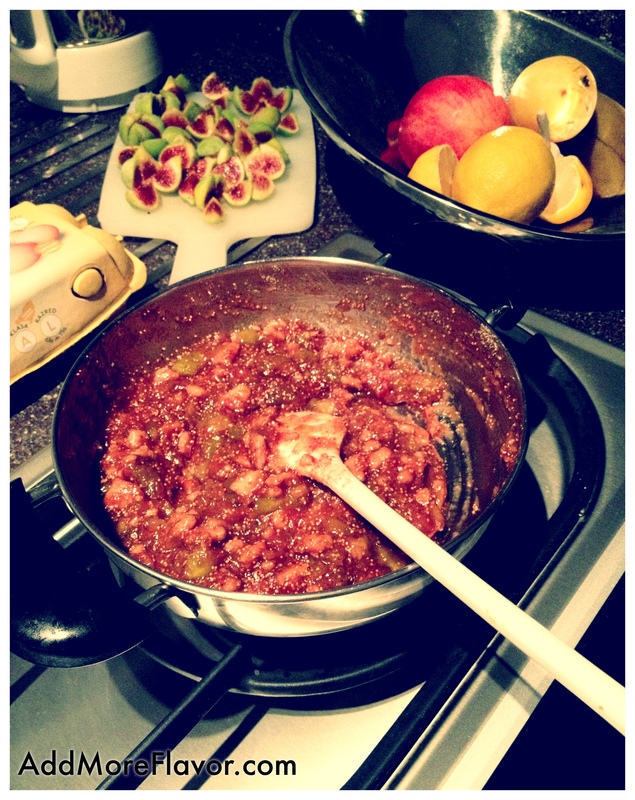 Make filling: cook figs in sugar, prosecco and cognac on medium heat. Add cinnamon and sprinkle with lemon juice. Cook for about 15 minutes. Cool and then add finely blended butterbiscuits. For topping: caramelize sugar on medium heat, then add figs cut in four. Take figs out very quickly from pot, it takes less than a minute. Take out baked dough lifting edges of parchment, transfer crostata to a serving plate. 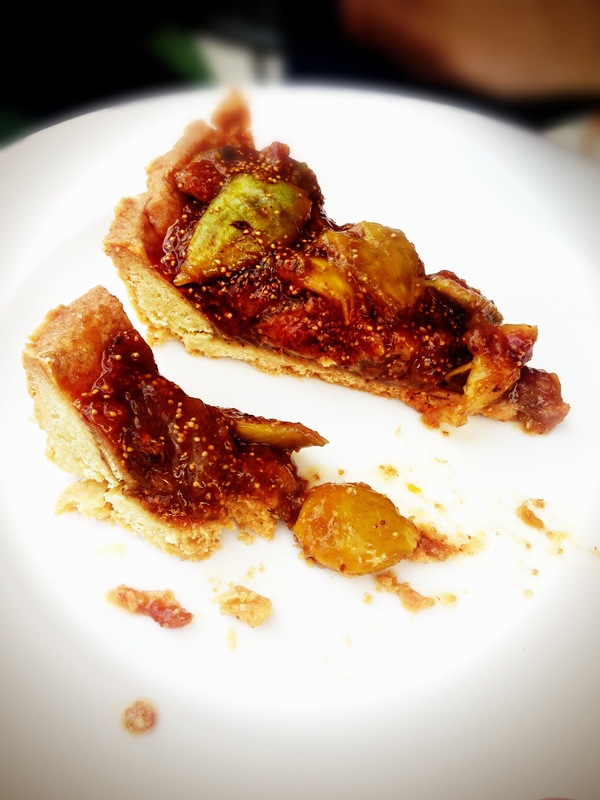 Fill crostata with fig filling and then put caramelized figs. It’s not necessary to refrigerate cake unless it’s really worm inside the house. 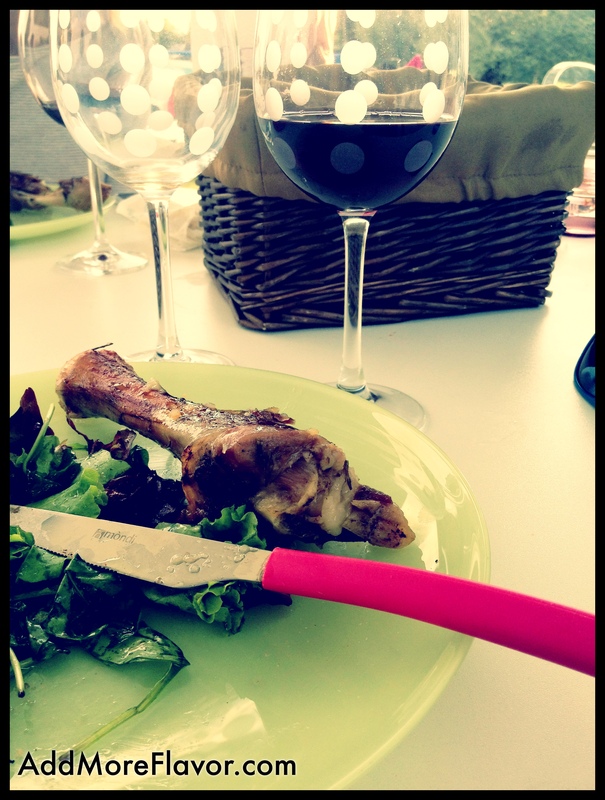 We had great family lunch yesterday. My sister recently got back from NY with her family so they invited us for family gathering. It was very sunny day, couldn’t imagine better way to spend Sunday. My only task was to make a dessert while our husbands were busy doing everything else, from waking up at 4 am to get lamb from Island of Krk, choosing wine, preparing food and even decorating table. I love having lunch with my family as we all appreciate precious moments we spend together, having good time making jokes on one’s expense and enjoying food set on table. We had delicious meat menu, this time nothing vegetarian: spicy lamb chowder, grilled lamb chops and lamb roasted with potatoes and fresh rosemary. We tasted great wines… Cabernet Sauvignon 2007 Napa Valley from Grgich Hills Estate, Tomislav Tomac’s sparkling wine, light-skinned white wine grape Pošip from Grgich Hills Estate and Super Istrian Cuvee 2008 from Roxanich. I didn’t tried dessert wine as I was busy serving cake so I continued drinking my absolute favourite Cabernet Sauvignon that my sister and her husband bought directly from Grgich during their first visit in California. Lamb chowder was delicious, have to ask a recipe. It cooked for hours in wonderful Staub Dutch oven so it has to be yummy. My choise of desert was double layer chocolate cake, it would be a sin to continue lamb menu with something light as fruit cake, wouldn’t it? 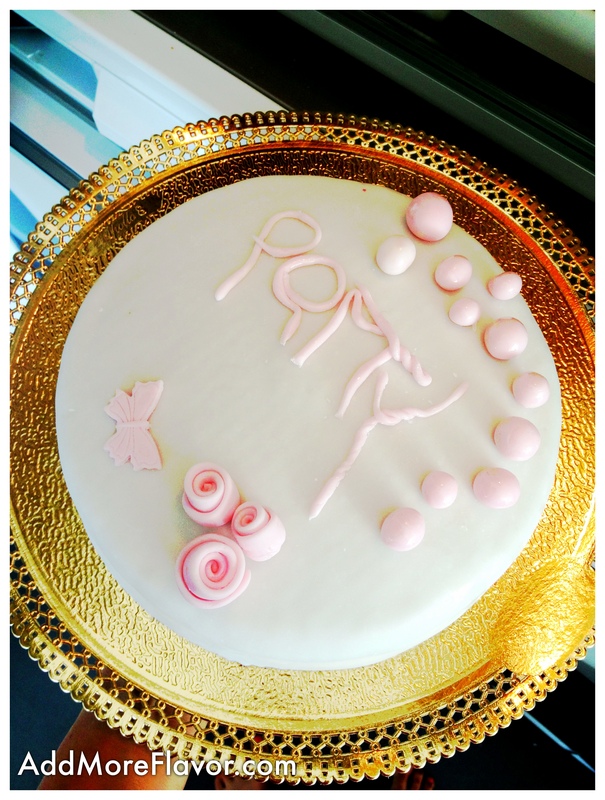 Here’s a recipe, you won’t regret trying although fondant decoration is not really necessary, it depends on occasion. Wisk together egg whites, salt and sugar. Mix until sugar is melted and egg whites firm. Slowly add yogurt, oil, cocoa powder,flour and baking powder. Line ring mold (I used 10.2 in) with acetate paper and place it on a sheetpan. Measure the circumference of the ring mold and cut a strip of cake accordingly. Place mixture in mold and bake in preheated oven on 338 F for about 30′. Let it cool. Bring the heavy cream, milk, sugar and vanilla extract to a boil and pour over the chopped chocolate. Mix slowly starting from the center until all incorporated and creamy. Let it cool. Place in fridge. Mix heavy cream with sugar and vanilla extract until is tender, add melted and cooled white chocolate and mix until is reaches mousse texture. Let it cool in fridge. It was my first time making fondant so I was patient (you should also be if it’s your fist time). It’s actually not so complicated as it seems so one should try for fun. First step is to measure 700 g sifted sugar and to place it in a large bowl. trying to make a well in the center. 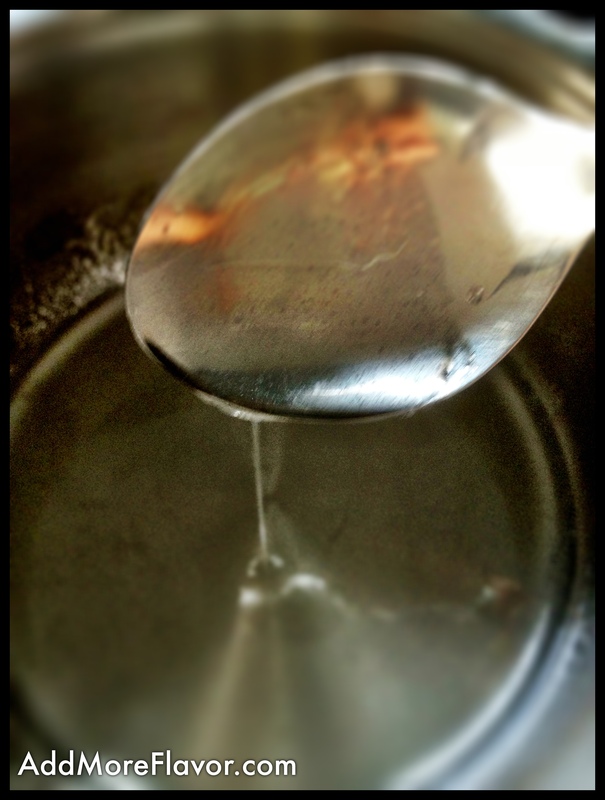 Dissolve fruit sugar with 1 tbsp cold water in small saucepan. Sprinkle gelatin over 6 tbsp water in a cup. Let sit for about 5 minutes, stirring frequently and then stir to dissolve gelatin. 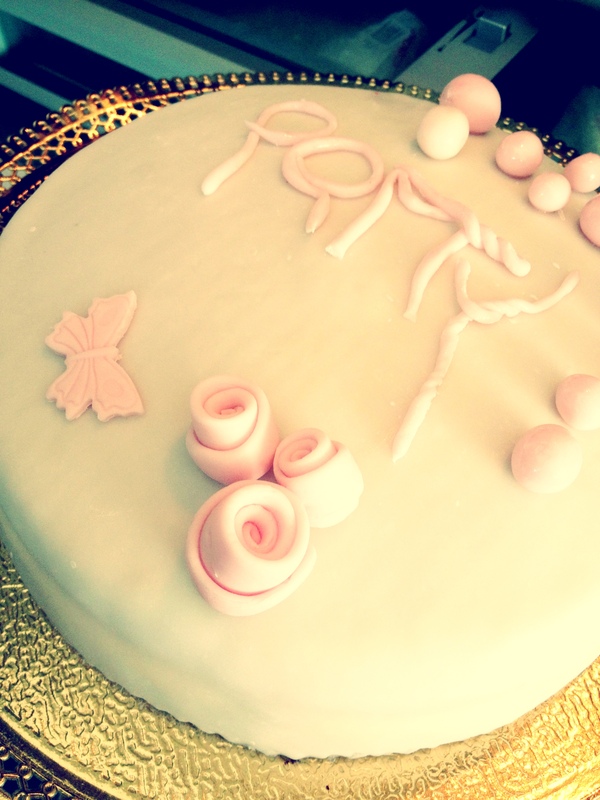 Don’t forget to add glycerin, it is really necessary for good rolled fondant. Pour the warmed, dissolved gelatin-glycerin mixture into the well over the top and mix in with rubber spatula or wooden spoon. Mix until the dough is too stiff to stir. Knead dough until of the sugar is incorporated. Transfer to a surface covered with powdered sugar and continue to knead until smooth and satiny. This will be the texture of clay. 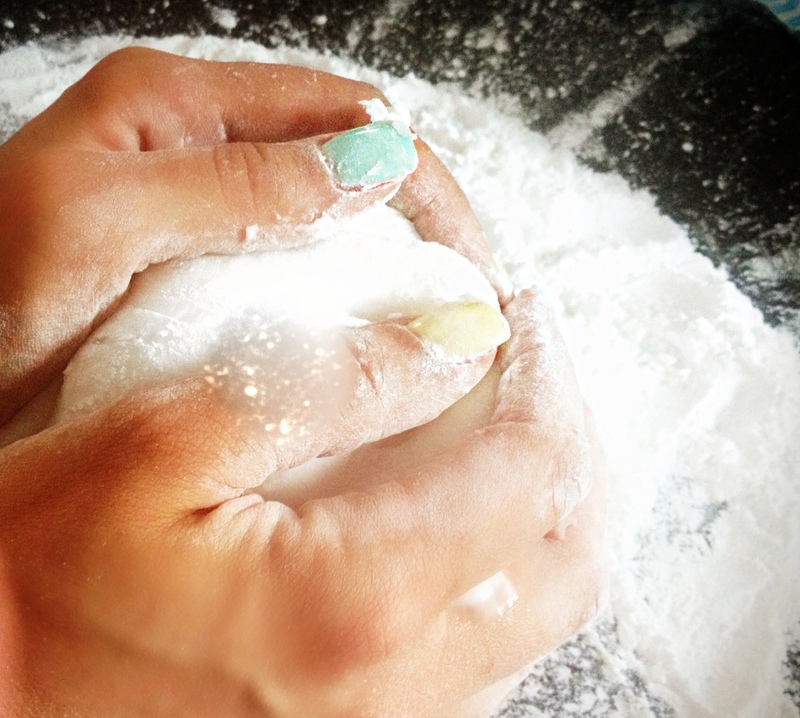 If the fondant is too dry, add in a few drops of water and if it is too dry, add in a bit of powdered sugar. 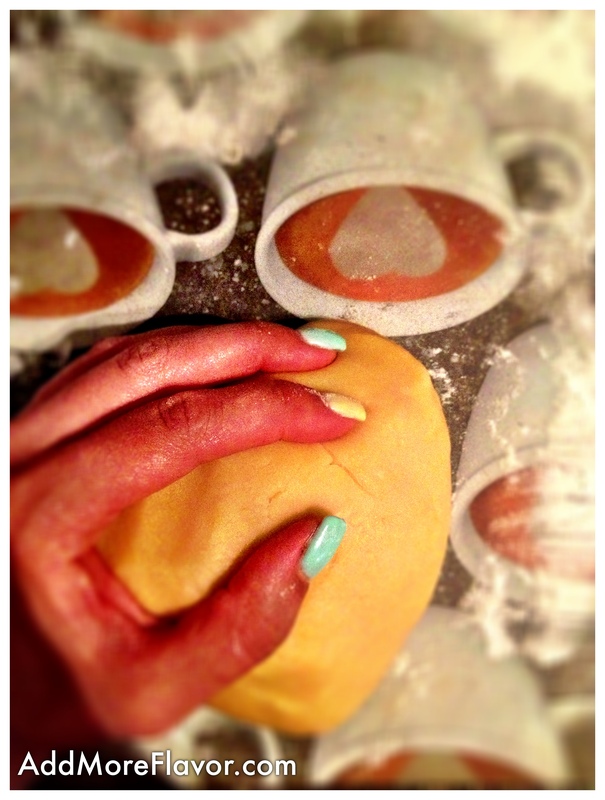 Shape the fondant into a ball, flatten slightly and wrap well in plastic wrap. Let rest for 20 minutes before rolling and using. Put it in hermetic bowl in fridge, then it can be used for few months. When you want to use it place in microwave for few seconds. Be careful not to overheat because it gets very warm inside, 1-2 seconds are enough. Cut biscuit in half, cover one half with dark chocolate ganache and then carefully pour over white chocolate mousse. Finish with other half of biscuit. 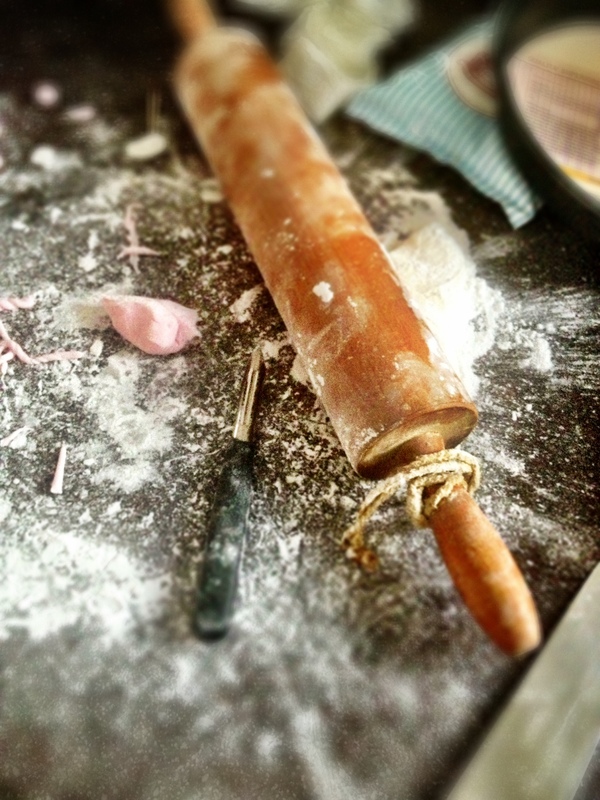 Then roll fondant bigger then you think it needs to be, put it back on rolling pin and put it directly over cake. Cut off all excess using pizza or pastry cutter. If you have fondant smoother, smooth it all down. If not you’ll have to use your own hands, like I did. Unless it’s a wedding of special occasion cake, result will be quite good as well. That’s all folks. 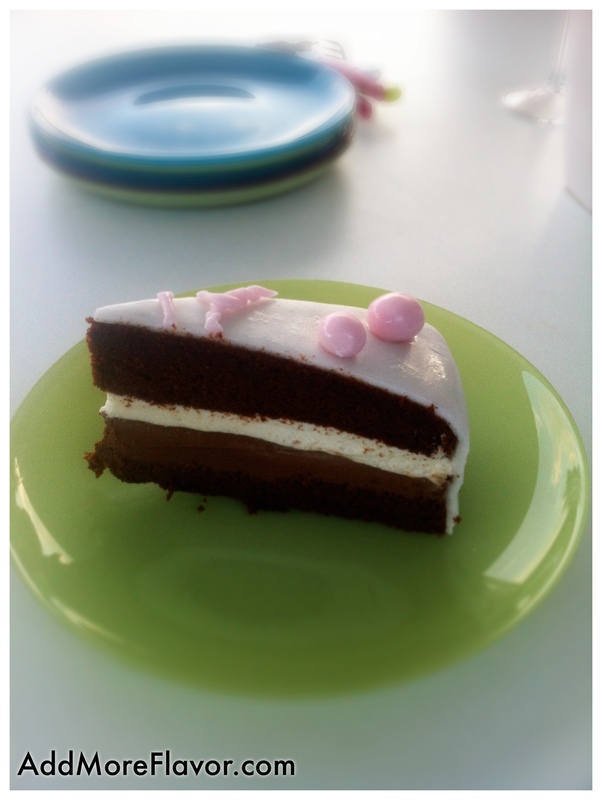 We all enjoyed cake, I hope you will too!